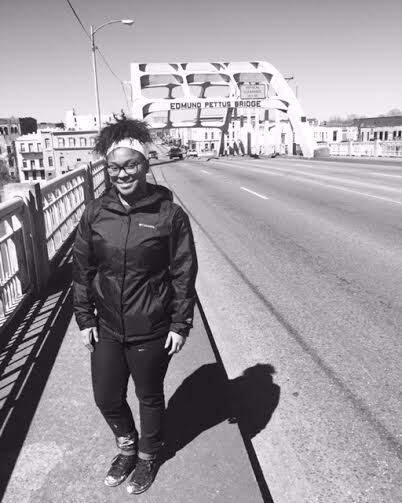 This spring break I was selected to participate in a life changing experience: an Alternative Spring Break trip to Selma, Alabama. When I arrived in Selma, Alabama I was immediately exposed to a different environment that was much more rural. The sights were beautiful with the countryside, fresh air and animals. We were to complete community service for four days during our week-long stay in Alabama. The energy and motivation we felt doing service for the people living in Selma struggling with poverty created a bond to the place they call home. We painted, cleaned and rearranged houses inside and out to make the house feel more like a home. However, painting and cleaning was not the purpose of the community service. More importantly, we heard stories about the neighborhoods and the struggle that the Selma community faces and why. We were able to show accompaniment in listening to what these people have lived through in this historical city. During the last two days, we visited downtown Birmingham, Montgomery and Selma. In Selma we saw and walked on the Edmund Pettus Bridge- a bridge that witnessed the greatest marches of the civil rights movement led by Dr. Martin Luther King, Jr. We visited the 16th Street Baptist Church in downtown Birmingham that shook the nation when this church was bombed in the 1960s, killing four innocent little girls inside the church. Seeing Dr. Martin Luther King Jr’s home in Montgomery, the Jackson home in Selma and the Rosa Parks Museum at Troy University in Birmingham gave chills hearing the stories of how leaders met to create plans to overcome discrimination, oppression and violence. If we are wrong, the Supreme Court is wrong. If we are wrong, the Constitution of the United States is wrong. If we are wrong, God Almighty is wrong.Rev. Martin Luther King, Jr. Going to Selma, Montgomery, and Birmingham made me appreciate more deeply the Voting Rights Act of 1965 and what this meant for a community of people whose votes were restricted due to the color of their skin. I am motivated to continue fighting racial inequality and educating my generation about the importance of voting in every election. The entire experience changed my way of thinking about what is needed to be done in the world to create true freedom and equality. Dr. Martin Luther King Jr began a movement that took over the nation. But he was not alone, he had the support of his community to create change and spread solidarity. His work was just the beginning of a mission that future generations continue working for. His words echo for current social justice movements today: “If we are wrong, the Supreme Court is wrong. If we are wrong, the Constitution of the United States is wrong. If we are wrong, God Almighty is wrong”. –Dr. Martin Luther King Jr.
Joseline Aruajo is a current NETWORK intern and a Junior at Trinity Washington University studying Sociology and History. This entry was posted in Voting and Democracy on March 24, 2016 by networklobby.